St Andrew's Church was an early design of R C Carpenter, one of the chief proponents of the Gothic Revival. Consecrated in 1846 it did not survive inner-city redevelopment and was demolished by 1985. Its name is now preserved in that of its giant neighbour, Birmingham City football ground. The image above was posted on the Birmingham History Forum - http://forum.birminghamhistory.co.uk - and is assumed to be out of copyright. If copyright has been infringed, please contact me via this site - Contact. The former Parish of St Andrew's is now part of All Saints' Parish, Small Heath - http://www.allsaintsonline.co.uk. 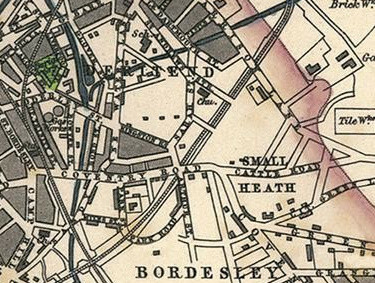 You might also be interested in A History of Birmingham Places & Placenames . 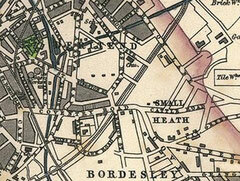 . . from A to Y - Bordesley - http://billdargue.jimdo.com/placenames-gazetteer-a-to-y/places-b/bordesley/. 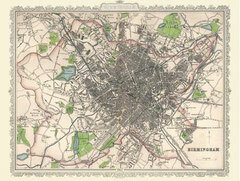 Above: Archibold Fullarton’s map of Birmingham 1866. Image courtesy of the Mapseeker website - http://www.mapseeker.co.uk/ - use permitted for non-commercial purposes. St Andrew's Church appears on the 1890 Ordnance Survey map available at British History Online - http://www.british-history.ac.uk/mapsheet.aspx?compid=55193&sheetid=10099&ox=479&oy=2083&zm=1&czm=1&x=276&y=282. St Andrew’s Church was the fifth and the last of the churches built by the Birmingham Church Building Society, otherwise known as the Ten Churches Fund. It was designed by R C Carpenter and was consecrated in 1846, a parish was assigned from that of St Peter & St Paul Aston. Built of red sandstone and comprising a chancel, nave, north aisle and a west tower with a spire, it was Carpenter's second Birmingham church, the first being St Stephen’s Newtown. Built in red sandstone in decorated gothic, it was considered an excellent example of its type and had all the appearance of a small country church. Following his success of his two Birmingham churches, Carpenter became a nationally known architect who was strongly associated with A W N Pugin and the Cambridge Camden (later the Ecclesiological) Society, passionate proponents of the Gothic Revival. 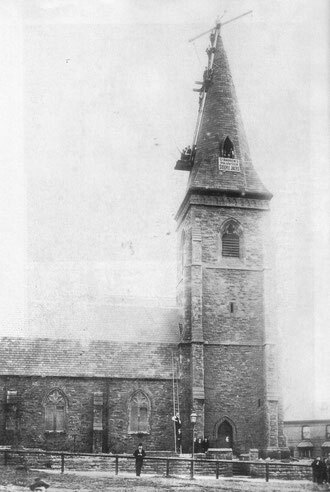 The spire of St Andrew’s was removed after serious storm damage in 1894, and the church building was restored in 1901. As the urban area of Birmingham spread in Small Heath, an iron chapel of St Andrew’s was licensed for worship in 1882 which was later consecrated as St Oswald of Worcester, Small Heath. 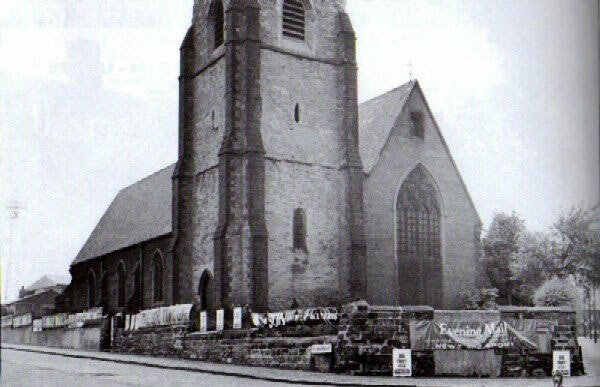 St Andrew’s Church was demolished in 1985 when this part of Bordesley was redeveloped. After closure the parish was amalgamated with that of St Aidan's, Small Heath which became part of the Parish of All Saints, Small Heath in 1998. The image above has been posted on the Birmingham History Forum - http://forum.birminghamhistory.co.uk/showthread.php?t=30382 - and is assumed to be out of copyright. If copyright has been infringed, please contact me via this site - Contact. See the website of All Saints' Church, Small Heath for a history of the local parishes which include St Andrew's - http://www.allsaintsonline.co.uk/information/history/history.html. Some account of the career of R C Carpenter 1812-1855 can be found at the Sussex Parish Churches website - http://www.sussexparishchurches.org/content/view/332/40, and the Dictionary of Scottish architects - http://www.scottisharchitects.org.uk/architect_full.php?id=200218.